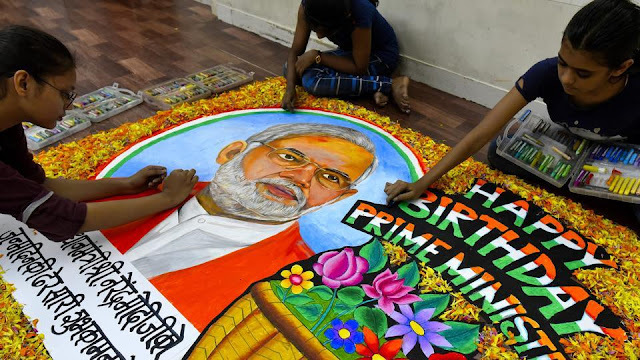 PM Narendra Modi Celebrates 67th Birthday: The Prime Minister Narendra Modi turns 67 today. He planned to inaugurate world’s second largest dam Sardar Sarovar Dam on his birthday. After a long time nearly six decades finally, the inaugural event of the Sardar Sarovar Dam to be held by PM Modi today. The BJP marks Prime Minister Narendra Modi’s birthday as Seva Diwas across Nation. His Birthday starts with blessings of her mother. Now he will be heading to inaugurate Sardar Sarovar Dam on a river Narmada in Gujarat. This inaugural event on the occasion of PM Modi’s 67th birthday will also mark the culmination of the fortnight-long Narmada Mahotsav that will be launched by Gujarat government. Along with Prime Minister Narendra Modi, this event will be attended by many BJP ministers. And the BJP chief Amit Shah, Finance Minister Arun Jaitley, Human Resource Development Minister Prakash Javadekar, Human Resource Development Minister Prakash Javadekar and many other leaders plan to celebrate PM Modi’s birthday as “day of service” (Seva Diwas) Nationwide by attending medical camps, blood donation events, and taking part in cleanliness drives. Prime Minister Narendra Modi decided to dedicate his whole day to India. The Sardar Sarovar dam project was started in 1961 and the construction began in 1987. This project would be benefited with irrigation Narmada water will flow to over 9,000 villages of Gujarat through a canal network.